Kellogg Company has pledged to provide one-half billion servings of breakfast to children and families who need it most, through its new Breakfasts for Better Days initiative. Kellogg’s is again partnering with Action for Healthy Kids for the third annual Share Breakfast cause marketing effort, which donates one breakfast (up to 1 million) each time a consumer shares a message on Facebook, tweets the #sharebreakfast hashtag, pins toPinterest or watches a YouTube video. Consumers can also redeem rewards codes inside cereal boxes to earn a wrist band that also triggers a meal donation. Additionally, when consumers redeem coupons inside special Kellogg product packages, a meal donation is unlocked. 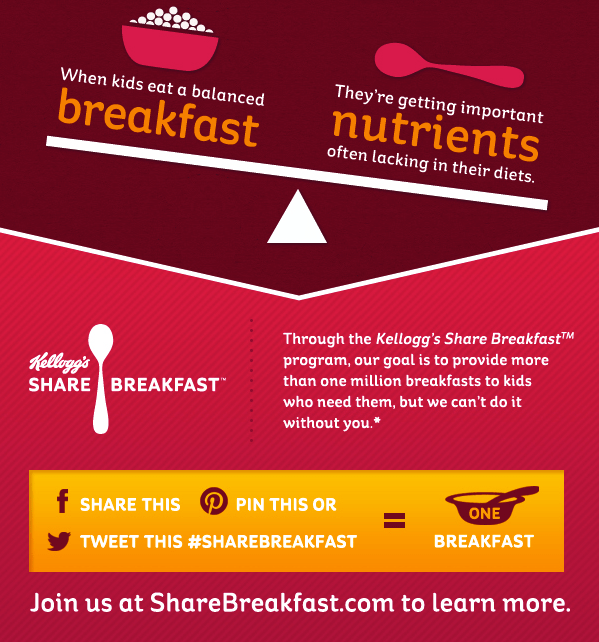 The third year of Kellogg’s ‘Share Breakfast’ campaign offers consumers multiple ways to engage. As contrasted with its two prior year iterations, this year consumers only need to share a message via social networks instead of describing their breakfast or uploading a photo – a streamlined engagement that undoubtedly lowers the barrier to entry. Extending its reach to in-pack coupons and rewards points is another interesting addition. The campaign website does an effective job visually sharing the need for breakfast as well as tracking participation to date. It is very sad children arrive to school hungry and go to be without dinner. We as USA citizens should be a shame of spending money on funding elections. Thousands of dollars are spent on a chicken dinner for fund raising efforts. The cost of breakfast, lunch, and dinner foods for a family is cheap. The cost of a pair of Jimmy Cho shoes could feed thousands of children breakfast for months.